And it will cost you a fortune. 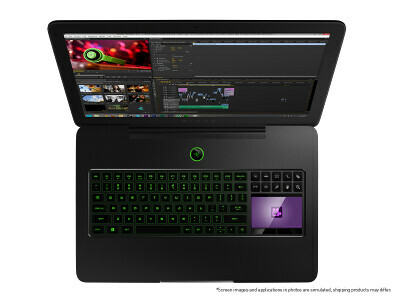 The new Razor Blade Pro, an ultrasleek, ultrafast gaming laptop, is going on sale June 3rd. Honestly, this is the coolest PC – OK – coolest computer on the market… And that’s a big step to take for an Apple fanboy. Beyond the gorgeous full HD display, this 17 inch laptop has 10 “dynamic keys” and an LCD trackpad. So what does that mean? These are 10 keys on the keyboard, each with a built-in display, so you can set them to any function, and assign an image to that key. It can even be app specific. For example, in email, you can have a refresh mail icon on one, a send on another, and a reply on another, while in video editing, you can have keys for tools like trimming, cropping, and scaling. This is extremely valuable for professionals tired of memorizing complex keyboard shortcuts for simple operations. The LCD trackpad is essentially a screen serving as a mouse. Just like any other laptop, you can use the trackpad as a normal mouse, but you can also use it as a touch screen, touching up photos in Photoshop by hand, previewing video, or selecting colors. It’s essentially adding an unobtrusive touch display to a traditional laptop. It’s also got an HD webcam, as can be expected. This 17 inch behemoth is less than an inch thick, and weighs under 6.6 pounds. That may sound like a lot for a laptop, but keep in mind that it weighs the same as Apple’s last 17 inch computer, bringing it well within its’ weight class for computers of that size and power. This beast may be light, but it didn’t compromise on power. It has the 4th generation Intel Core Processor, which hasn’t even been released yet, a small 256 GB SATA III SSD (upgradeable for a price), an NVIDEA GE Force graphics card, with 2GB of video memory, and eight gigabytes of DDR3 RAM. This monster machine comes at the monster price of $2,500 for the starter model, and it only gets more expensive from there. It’s targeted towards high-end gamers and graphic arts professionals, but I could see this gaining popularity amongst the “I saved up for this all my life” crowd, because this is just insanely cool.